After 10-years of providing steadfast market guidance, countless charts and numerous forecasts, I must admit that it becomes rather challenging to come up with new and unique ways in which to talk about and promote the benefits of subscribing to such services for interested readers. I suppose one way of cutting to the chase is to illustrate for readers precisely what Tom Cruise so desperately demands in the 1996 film, Jerry Maguire. Yet another aspect of interest for many might be to learn how such specific guidance fares on a day-to-day basis amid sudden market volatility. Since we've just recently moved through, and may likely remain mired within a market condition harboring such volatility, I thought it might be different and interesting to show how Elliott Wave Technology’s specific market guidance is panning out in recent weeks. One of the rather distinguishing aspects of Elliott Wave Technology’s solutions-based services is that win, lose, or draw; each of our subscription services provides a specific ongoing account of performance relative to the guidance provided at every level of engagement i.e. short-term, medium-term, and long-term. As such, to come up with something a bit new and unique, I thought I’d share an actual time-lapsed spreadsheet account of our short-term macro portfolios performance amidst the recent market volatility over the past several weeks. 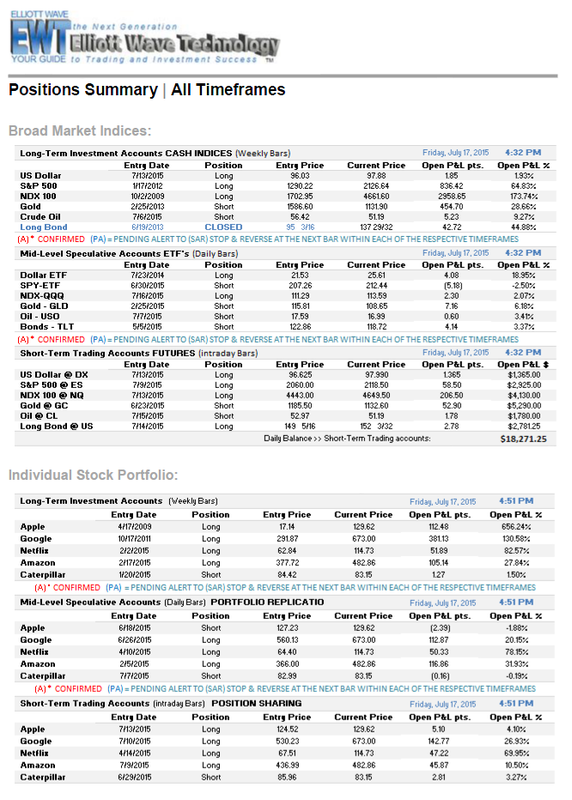 First, we’ll take you back to June 26, just prior to the latest rash of volatility, and provide a spreadsheet summary of all positions held by the model portfolio at the time – and within each time-frame. Thereafter, we’ll focus exclusively on the daily balance fluctuations within our short-term macro trading accounts. 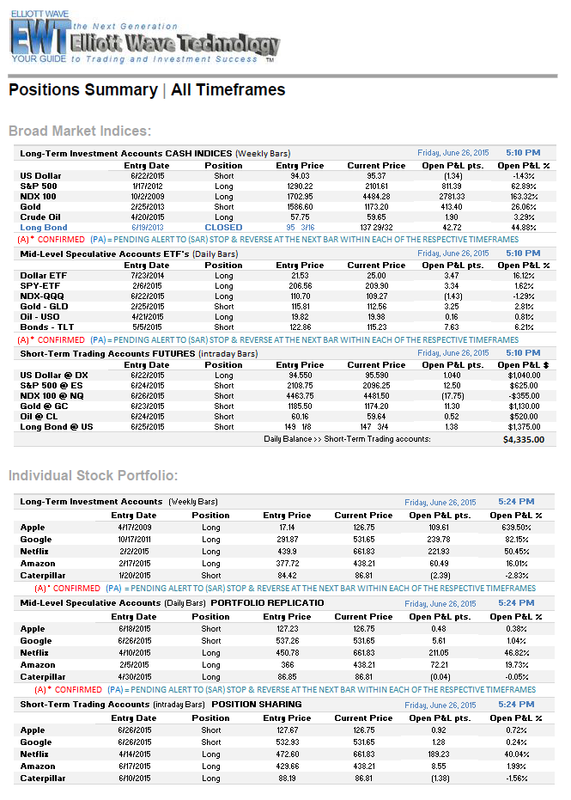 Then finally, we’ll wrap up with a final version of the complete portfolio status as of July 17, 2015 - providing you with 3 full weeks of day-to-day accounts of what transpired therein. 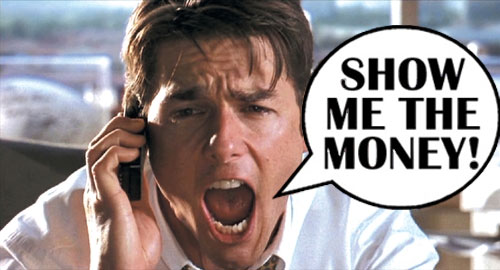 Bear in mind that the basic purpose of this piece is to simply “show you the money” flows. I am not setting out here to provide a complete performance related equity curve or to provide a full accounting of the portfolios performance and/or provide comprehensive net outcomes of each and every trade – rather by way of the actual time lapsed spreadsheets furnished in each of the daily updates, I’m simply attempting to provide interested readers with the quick “money shots” version of how profits and losses can typically ebb and flow during periods of sudden market volatility. The model portfolio holds 17 positions in the broad market of which, 5 are long-term positions, 6 are medium-term trade positions, and 6 are short-term speculative positions. As of June 26, 82% of the broad market positions were in profit, only three of the 17 positions held were losing ground. Of the three, there was one losing position within each dedicated time-frame. We had recently taken double-digit profits on dollar long positions and reversed short on June-22. This new dollar short was down 1.43% in long-term investment accounts. In medium-term speculative accounts, the NDX (QQQ) exchange traded fund began banging us around with whipsawing signals, and the long position established on 6-22 from a price of 110.70 was down 1.29% at the time. Similar action was taking place in the NDX short-term futures accounts where a short position established on 6-26 was under water by $355 dollars per contract. The largest percentage gainer held in long-term accounts was the long position in the NDX, which was up over 163% from a well-timed bullish entry back in October of 2009. The largest percentage gainer held in Mid-Level accounts at the time was a long position held in the US Dollar ETF, which was up over 16% within a one-year time-frame. The largest dollar winner held in short-term trading accounts at the time was a short position in the long bond, which was up $1375 per contract – followed a close second by long positions in US dollar futures, which were up $1,040 dollars per contract. The individual stock portfolio is equally impressive across all time-frames, and is rather self explanatory. With the sole exception of the US Dollar, at the close of trade for June 26, short-term speculative trading accounts were virtually short the macro markets across the board. By the end of trade for the following session, the Safe Haven singular long position switched from the US Dollar to the US long Bond. Of note is the obvious “taking of profits” in the previous days US Dollar long position and a reversal to the short side. Note how recent short positions taken in the balance of the macro markets have gained ground – pumping up the end-of-day balance north of $7,000 per contract despite the recent profit-taking in the original US dollar long position. As the new week begins to unfold, the short-term speculative portfolio gives up a little ground as it reorients itself on the long side of the two most favored Safe Havens – The US Dollar, and the US Long-Bond. By Mid-Week, the short-term downward drift in the S&P 500 appeared to be waning and the systems platform instructed users via a real-time email alert to take profits on S&P shorts and reverse to the long side. Also, note the taking of quick losses on the previous day’s long position in bonds and the profitable reversal to the short side, which shows $1700 in open profit per contract held. Of note as well are the respectable open profits building steam in the model portfolios short Oil position. By Thursday, we were back to the same long vs. short arrangement that we had adopted earlier in the week on Tuesday. Here again, after taking a mix of profits and losses on various positions, the balance registering in the short-term model account by days-end gave up a bit of ground. The week beginning July 6 began to show signs of marked worry over the solvency issues in Greece. Despite the logical reflex to become bullish on Gold amid such concerns, note how the short-term trading strategy remained steadfast to its underlying principles by maintaining a profitable short position in the monetary metal. Trading to the short side of Crude Oil, and a bullish position in the US long-Bond worked wonders toward vaulting the daily account balance northward beyond 5-figures per contract traded. With the new week well underway, the roller-coaster ride in the S&P 500 proved a bit too maniacal to get a firm handle on. Despite the short-term difficulty in attempting to scalp the S&P, similar positions in the Dollar, Gold, Oil, and the long-Bond more than made up for such annoyance. Upon returning from the July 4 Holiday, we found the macro model portfolio once again “short” across the board with the exception of a long position in the US Dollar. As the shortened Holiday week closed out, the portfolio took a healthy dose of profits on the Crude Oil trade, and moved short Oil once again after a small loss incurred while attempting to reverse to the long side. We also ended the week short the Dollar, and back on the long side of the S&P. The short-term speculative portfolio opened up the new week ending July 13 long the Dollar and Equity indices – and short Bonds and the Commodities. Tuesdays close brought with it some profit taking in the portfolios short Bond and Oil positions, while holding steady to the long side of the Dollar and Equities. At the close of trade mid-week, the portfolios daily account balance once again crept up beyond 5-figures per contract held. By sessions-end, the portfolio was once again back on the short side of Crude Oil. Moving toward the final stretch of this time-lapsed spreadsheet review, we see that Thursday’s macro portfolio bias was unchanged from the previous session, and by days-end, was yielding over 15K in open profits per contract held. Here, at the end of this particular time-lapse sample, the short-term model portfolios position bias remained unchanged since mid-week, which was long the rigged financial sphere, and short tangible commodities via the likewise rigged futures markets. As promised, we conclude this time lapse exercise with a complete position summary for both the macro markets and the model portfolios composition of individual stocks – in each of the three time-frames. Of particular interest is the outstanding performance of the individual stock portfolio within each of the designated time-frames. Of the 15 positions held amidst the 5 stocks, (one position for each specific time-frame) only two were in negative territory for medium-term accounts. The short position in Apple taken on June 18 was down 1.88%, and the short position taken in Caterpillar on July 7 was down 0.19%. Of the 15 positions, 86% were in profit and 73% of the 15 positions were in double-digit profits - or more. Two of the positions, Apple and Google, were sporting triple digit open profits – 636% and 130% respectively. Draw from it what you will. In closing, this type of short-term trading is not for everyone. Yes, the short-term portfolio gets banged up a bit every now and again – but over time, it performs extraordinarily well. The same can be said for the longer duration and medium-term time-frames albeit with far less trading activity. The Chart Cast Pilot provides real-time email alerts for position changes for both the macro and individual stock portfolios in all three time frames.